There are many people that come to the Salmon River near the town of Main Brook in Newfoundland, Canada to spend their day fly fishing. 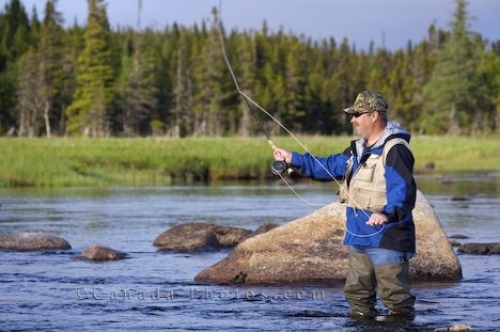 This man is fully prepared with his waders, vest and rod as he cast his fly fishing line hoping for a bite or two. Man fly fishing in Salmon River near the town of Main Brook, Viking Trail, Northern Peninsula, Great Northern Peninsula, Newfoundland. Model Released. Picture of a man knee deep in the Salmon River in Newfoundland, Canada enjoying his time fly fishing.